This pattern comes from The Stoney Creek Cross Stitch Collection July-August 2001 Volume 13, number 4. 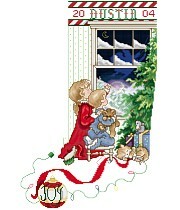 The pattern displays two children peeking out the window on Christmas Eve to get a glimpse of Santa. There is an alphabet and number line included to be used for personalization of the stocking.